The front exterior of 24 Sussex Dr. When our friends at CPAC first came to us with a story titled “Inside 24 Sussex” we thought we were invited for a tour inside the prestigious address. (What to wear? How to get past security …) And it is a tour — of sorts. 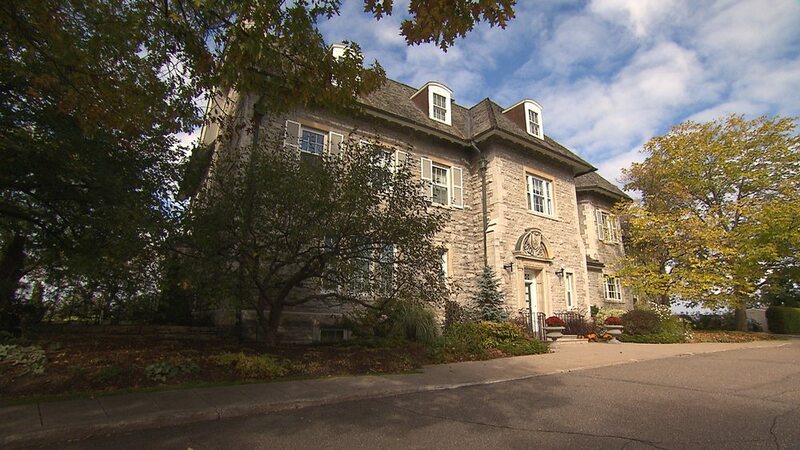 The hour-long documentary sees former resident — Catherine Clark, daughter of Joe Clark and host of CPAC’s Beyond Politics — chatting with Laureen Harper, and explores the architecture, history, and lore of 24 Sussex. Now archived here, viewers can also hear stories from Margaret Trudeau, Maureen McTeer, Sheila Martin, as well as Caroline, Ben, Mark, and Nicolas Mulroney. Hear about how politicians and their partners raised children in an official home, how security has changed over the years, and how PM Harper makes room for jam time with his band. Was it difficult to get access to 24 Sussex? Why do you think the Harper’s office agreed to this television special? We had a number of conversations with the Prime Minister’s office to tell them that we were interested in touring 24 to introduce it to our viewers from a historical perspective, interlaced with rich personal stories, and they were very open to the idea. 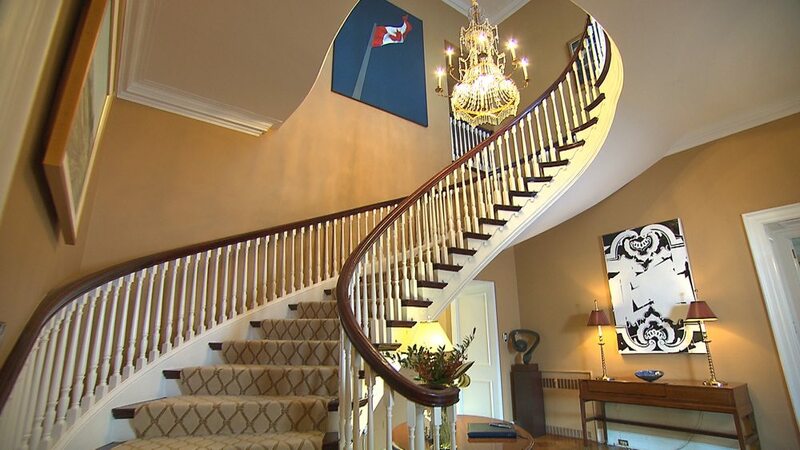 We had the benefit of being able to show the PMO some of the beautiful footage our producer, Catherine Christie Luff, and our crew had gathered of Rideau Hall for our CPAC documentary on Government House which aired last Fall, and they graciously allowed us to take a similar approach to 24 Sussex. Mrs. Harper was extremely engaging, open, and fun in our interview, and we were delighted to have the opportunity to speak to her about her family’s time at 24 Sussex, and how she has managed to raise two children in an official home. And about how, in a fantastic reversal of roles, her kids have to tell her husband to be quiet when he and his band get too loud. The formal dining room at 24 Sussex. Laureen Harper says she is happy to let the official decorators make decisions about paint colours and decor. What surprised you most about the residence? To be honest, nothing surprised me because the residence has stayed very much as I remembered it as a child, with few major changes. However, the big, imposing security scanner at the bottom of the driveway was new. As Ben mentioned in a part of our interview that did not make it to air, the extent of security when we were kids was to flash the car lights at the guard waiting at the gate! Times have changed. The show is called “The Residences: Inside 24 Sussex — Home of Canada’s Prime Minister.” Does this mean you are planning more shows on official residences? We are indeed. We were granted unprecedented access to Rideau Hall last year for a documentary called “Rideau Hall: Inside Canada’s House” which was released nationally last fall. We hope to do more at some point in the near future. Our series is based on my mom’s bestselling 1982 book “Residences, Homes of Canada’s Leaders” so there’s a very strong personal connection to this series, and CPAC and I are eager to take Canadians behind the scenes into the homes where our political leaders live their private lives – which also happen to be the homes where I grew up. I understand you spoke with former residents like Margaret Trudeau and Ben Mulroney. What was the funniest anecdote you heard about life at 24 Sussex? We were very fortunate to have the chance to speak with my mother — Maureen McTeer — Margaret Trudeau, Geills Turner, Sheila Martin and all four Mulroney children. Everyone had very funny anecdotes to share, but the Mulroney kids told hilarious stories about the challenges and joys of growing up in an official residence – even our crew laughed as they taped the interview. You’ll have to tune in for the Halloween stories in particular. What has changed over the years at the residence? 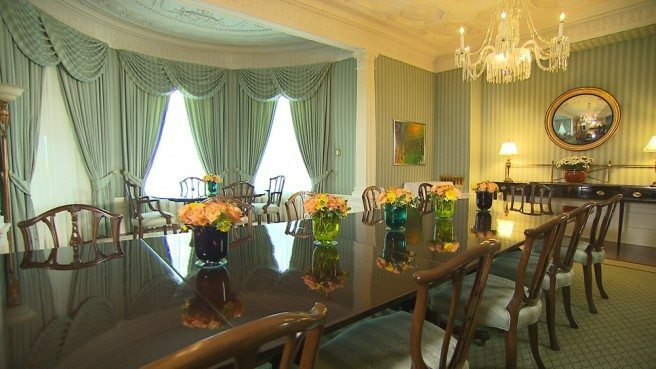 The residence itself was transformed – some say gutted – when it was turned from private home into the official residence of the Prime Minister in the 1950s. Since that time, very little has changed. Mr. Trudeau added a pool, and Mrs. Trudeau made renovations to an upstairs room that would become her Freedom Room, but otherwise the changes have mainly been cosmetic. Wall colour, carpets, the art, and some furniture have evolved with time and the personal style of the residents – but viewers will be astonished at how much has remained the same. The dramatic stairway is a showcase for a variety of art. I see you and Laureen Harper are wearing a similar shade of Conservative blue. Did you plan your outfits in advance? We did not – total coincidence! I have to pick one outfit to wear at the beginning of each documentary, and I know it will be the outfit I’ll wear for about one full year of shooting. I have to like what I’m wearing because by the end of the shoot you want to put that outfit in a bonfire so that you never have to wear it again!